What I find most interesting is the little snippet where he’s editing the photo’s at home after the shoot, he’s using a Mac and we see him looking at an underwater shot in Adobe Camera Raw, then later on it looks like he’s adjusting the white balance maybe on the same shot in Adobe Photoshop. I use Adobe Lightroom when I’m editing my own photo’s at home but I have used Camera Raw at work and it does a similar job of tweaking the Raw files straight from your camera, Photoshop is obviously a lot more powerful than Lightroom and whilst I use it a bit I really don’t know much beyond the basics. 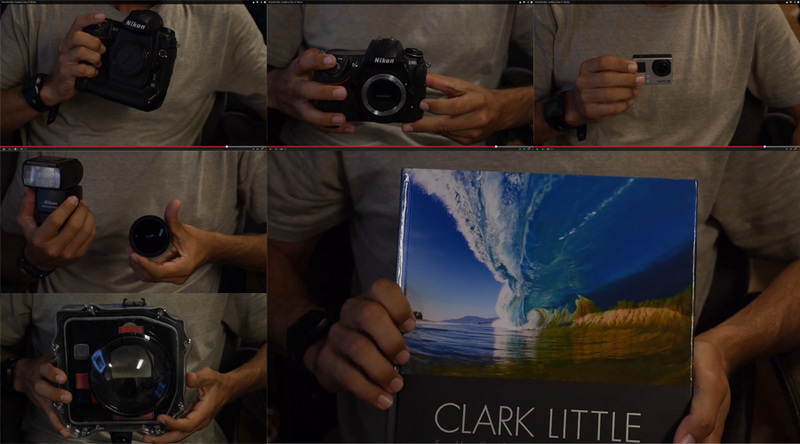 Clark Little’s photo gear, as featured in the Hurley Tour Notes video on Youtube. have a watch of it and get inspired for next time there’s a nice shorebreak, if you want to take flash photo’s keep checking back because there will be a post going up soon on my new, very simple, on housing flash set-up.